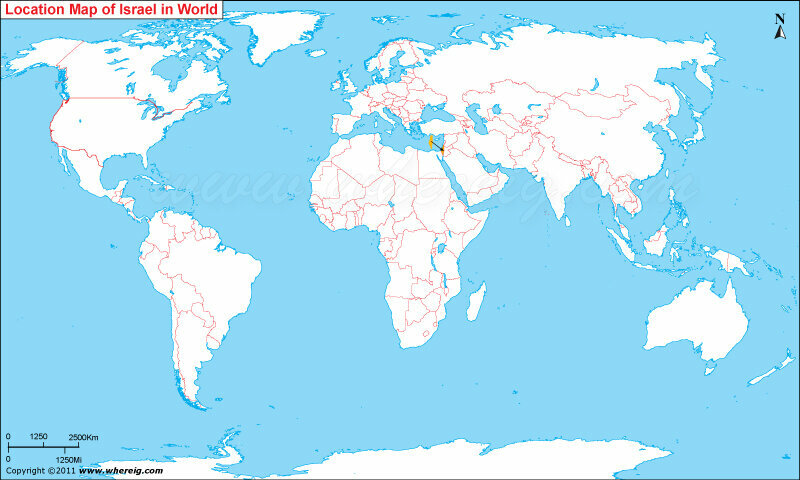 The given Israel location map depicts the location of Israel on the world map; Israel is located eastern coast of Mediterranean Sea. Israel is part of Middle East. It shares international boundary with Lebanon in the north, Syria in the northeast, Jordan in the east, and Egypt in the southwest. Besides, it also shares boundaries with West Bank in the east and Gaza Strip in the southwest. Surprisingly, Israel is the Jewish majority state and stands first in the world. The government type of Israel is parliamentary republic. Most of the months, Israel remains in news due to the dispute with West Bank, the Gaza Strip, and Golan Height. The internationally recognized international boundary between Israel and West Bank is not formally defined by the Israeli government. In the Middle East, Israel is a developed country along with representative democracy and parliamentary system where universal suffrage has been practiced since long time. Country�s capital city is Jerusalem but it is not internationally known rather Tel Aviv is the main financial hub of Israel. However, the industrial hub is Haifa. Israel has diversified climate, however, the western part largely have typical Mediterranean climate rain in winters and hot summer. Temperatures in Israel have big differences. The mountainous regions of the country can be windy, cold, and sometimes snowy. Surprisingly, Israel has the highest number of museum per person in the world. Israel tourism is world famous; especially religious tourism in Israel is an important industry. Additionally, Israel beaches, historical and archaeological sites, and of course various museums tantalize tourists of the whole world.